Plants 50-120 cm (roots fibrous). Herbage usually hairy (hairs spreading to ascending, to 2 mm), sometimes glabrous. 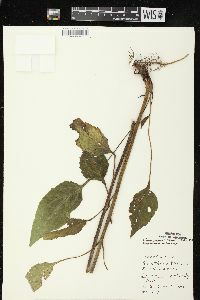 Stems usually brownish green. 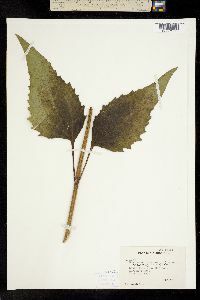 Basal leaves: petioles 0-17(-25) cm; blades 3- or 5-nerved, ovate to narrowly lanceolate, 5-30 × (1-)5-12 cm, bases usually rounded to cordate, margins usually serrate to dentate, rarely entire. 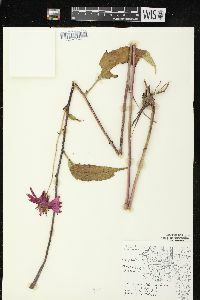 Peduncles 8-25 cm. 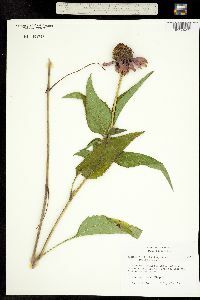 Phyllaries linear to lanceolate, 8-17 × 1-8 mm. Receptacles: paleae 9-15 mm, tips red-orange, straight or slightly curved, sharp-pointed. Ray corollas pink to purple, laminae spreading to recurved, 30-80 × 7-19 mm, sparsely hairy abaxially. Discs conic, 14-45 × 20-40 mm. Disc corollas 4.5-5.7 mm, lobes greenish to pink or purple. Cypselae off-white, 3.5-5 mm, usually glabrous (ray cypselae sometimes hairy on angles); pappi ca. 1.2 mm (teeth equal). 2n = 22. Flowering late spring-summer. Rocky, open woods, thickets, prairies, especially near waterways; 10-400+ m; Ont. 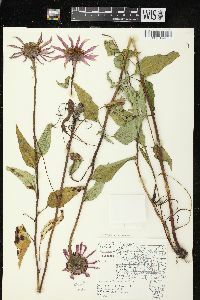 ; Ala., Ark., Fla., Ga., Ill., Ind., Iowa, Kans., Ky., La., Miss., Mo., N.C., Ohio, Okla., Tenn., Tex., Wis. Echinacea purpurea is introduced in Ontario. It and cultivars derived from it are extensively grown ornamentals in gardens, wildflower roadside plantings, and prairie restoration sites. Because of its popularity as an herbal remedy, it is also grown commercially. 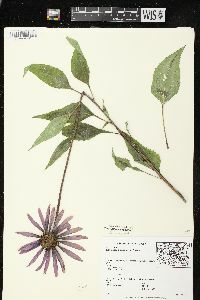 As a result of such activities, naturalized and persisting populations may extend the natural range of E. purpurea. Selections used for such plantings may differ from native forms. In prairie habitats and woodland. Very local. The prairie seems to be its preferred habitat. The published records are from the area of Delaware, Jay, Randolph, and Wayne Counties, the Lower Wabash Valley, the "barrens" of Floyd and Harrison Counties, and from Carroll, Cass, Franklin, Marshall, Tippecanoe, and Vigo Counties. In the woodland I have seen only isolated specimens. Stems 1-few from a coarsely fibrous-rooted crown, caudex, or short, stout rhizome, hirsute to glabrous, 6-18 dm, simple or often few-branched; lvs ±hairy on both sides, toothed or less commonly entire, the main ones with broadly lanceolate to elliptic or broadly ovate blade to 15 נ10 cm, mostly 1.5-5 times as long as wide, rather abruptly contracted (or even rounded or subcordate) to the petiole; disk 1.5-3.5 cm wide; rays reddish-purple to occasionally pale pink, 3-8 cm, drooping; 2n=22. Woods and prairies, generally in moister sites than no. 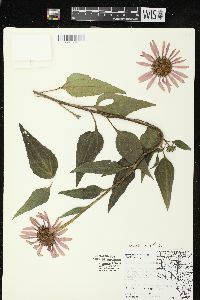 3 [Echinacea pallida Nutt. ]; chiefly Ozarkian and midwestern, from Ill. and s. Io. to e. Okla., extreme ne. Tex., and c. La., e. irregularly to s. Mich., Ky., Tenn., and Ga., and less commonly to Va. and N.C. June-Oct.